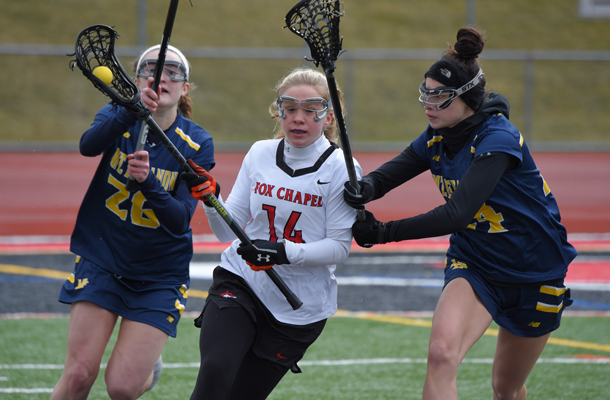 The Fox Chapel girls lacrosse team will be under the guidance of new coach Rebecca Hartrum this spring. She takes over a team that posted a 12-2 mark last year. With realignment, this year’s team will compete in Section 2-3A with Butler, Freeport, Indiana, Moon, North Allegheny, Fox Chapel, North Hills, Pine-Richland, Seneca Valley and Shaler. “We lost a few impact players to graduation but return 10 players and a lot of experience,” Hartrum said. Returning starters and letterwinners include seniors Julie Scheffler (defense), Rebecca Klaas (defense), Chase Murton (defense), Emily Ben (defense), Marissa Hardiman (midfield), Sarah Sinnott (midfield) and Makenna Blazer (attack), juniors Lizzy Guiffre (midfield), Sloan Rost (attack) and Mary Ellis (attack) and sophomore Hannah Humes (goalie). Freshmen Mira Tramontina (defense) and Sydney Kennedy (attack) also are expected to contribute. “The strong leadership from the senior class will be one of our strengths this season,” Hartrum said. “Plus, we are returning all of our veteran defenders. We also have huge scoring threats in Sloan Rost and Mary Ellis. My concerns right now are depth from the bench and transitions. The Foxes opened their season on March 22 with a 12-9 home loss to Mt. Lebanon. Hardiman scored four goals, and Ellis scored twice. Blazer, Emily Scheffler and Kennedy also scored. Ellis added three assists.